CAIRO — Water ministers from Egypt, Ethiopia and Sudan are meeting in Khartoum to try to resolve differences over Ethiopia's Renaissance Dam. Egyptian officials remain worried the Nile project threatens the nation's security. Egyptian, Ethiopian and Sudanese officials hope to reach an agreement on the Renaissance Dam, which has angered Egyptian officials and brought forth repeated objections to the project. This second round of tripartite talks follows a shift in allegiances among the three countries. Sudan has historically sided with Egypt in claiming the lion's share of the river's water and veto rights over upstream developments. But last week, Khartoum lent its support to Ethiopia's drive to complete construction. Ethiopian officials have tried to bring Sudan and others on board by offering access to future electricity generated by the dam. They argue the project should be seen as a pan-African effort. Yet Egypt remains worried. 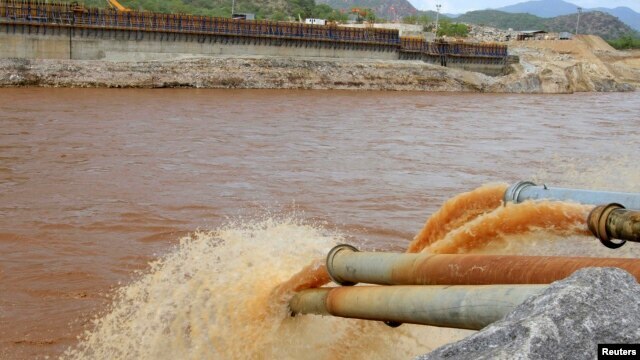 Ethiopia began diverting water earlier this year to fill the massive reservoir behind the dam, a multi-year effort that will lower water levels reaching Egypt. African Studies and Water Issues analyst Ayman Abd El Wahab of al Ahram Center for Strategic Studies in Cairo said Egypt needs compensation. He argued that Ethiopia has crossed the line from usurping Egypt's historic rights to the Nile to threatening national security. He pointed out that Egypt is alone among the Nile Basin countries to rely almost exclusively on the Nile for its water supply. Yet el Wahab agrees with many experts that there is enough water to go around, if the resource is properly handled and the nations along the Nile's banks can work together. Some Egyptian officials had sought a six-month delay in dam construction so the three countries can implement recommendations by an international group of water experts. Ethiopia is eager to move ahead on what is set to be Africa's largest hydroelectric dam, insisting the project will be a benefit to all.